Climate There are basically two seasons in the Galápagos. The dry, garua season runs from late June to December, when it is relatively cool and dry with more overcast skies and occasional drizzle or mist (garua) during the day. 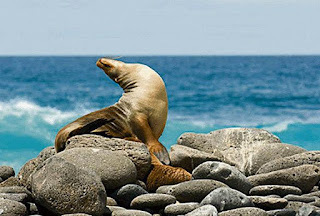 But this combination of conditions brings the breeding period for many sea birds and shorebirds, marine iguanas, sea lions and fur seals. Late December to June is considered the hot or wet season, with March and April usually the hottest, wettest months. Around December, the trade winds fall and the climatic equator (located north of the geographic equator) shifts south toward the Galápagos, causing the westward-flowing current to slow, reducing the upwelling and allowing warmer water from the Panama Current to invade the region. Rain clouds form when the inversion layer breaks down, and the air warms and rises, resulting in daily afternoon showers. They bathe the southern and central islands in cold water averaging 18°C (64°F). The Cromwell Current is a deep-water current flowing eastward under the South Equatorial Current, which flows to the west. It brings nutrient-rich water averaging 15°C (59°F), chilling Fernandina and the west coast of Isabela. Warm water currents, including the Panama Current and the North Equatorial Current bring tropical waters. Seasons are governed by changes in these oceanic currents and trade winds. In the wet season, roughly December through June, the point of convergence is farther south, resulting in warmer waters in the central islands during the wet season. The point of convergence is further north in the dry season, causing cooler waters in the central the Galapagos, with resultant water temperature in the southern islands averaging (18-20°C/ 64-68°F).